5 Cool Camping Gadgets For Your Camping Getaway! I found some pretty cool camping gadgets for your camping getaway. Are they necessary? No, but they could make your camping trip fun! Don't have a cup holder in your chair? Use these cool cup holders. Use them at a table, on a boat, or anywhere you need a cup holder. I'm sure you can come up with other uses, too, like hanging suits on the line or sealing a potato chip bag! Similar to glow sticks, but these snaplights are brighter and last longer. Hook to tent lines so no more tripping over wires! Attach to kids and pets so you always know where they are! This is just a fun camping gadget. It has a 27" telescopic steel skewer which makes roasting hot dogs or marshmallows easy at the campfire. Use this camping gadget for clean water away from home. It removes 99.9% of waterborne protozoan parasites per manufacturer. I'm not sure I would just stick this in a river and drink, but it's a lightweight water filter which is perfect for camping. This is so cool! Just heat the water in the stainless steel carafe, twist on the coffee filter and drinking mug, and Flip N' Drip. Great for those chilly mornings at camp. The only downside is it only makes one to two cups at a time. Stay tuned for more cool camping gadgets for your camping getaway! What Size Camping Tent Do You Really Need? Choosing a camping tent can be a daunting task. What size tent do I need? What material should it be? What brand? Choosing the right size tent for camping is probably one of the biggest dilemmas for campers. So, what size tent do you really need? Camping tents are classified as 1 man tent, 2 man tent, etc. the 2 people will be shoulder to shoulder. A general rule to follow when deciding which size camping tent you need is to add an extra camper. So for a party of 3 campers, you should get a 4 man tent. However that rule is for sleeping comfortably only, with little room to spare for other camping gear. If you want to store a lot of gear in your tent, you should add 2 or 3 extra campers. So for that same party of 3 campers, you should get a 6 man tent. I have a family of 5, so I got a Coleman 8 man tent, like the one pictured above. It has plenty of room for sleeping, and the 2 wings on the sides holds plenty of camping gear. I hope these tips help you find the perfect camping tent! I'm back with more Campfire Tips and Tricks! Who doesn't love a campfire? Well, I'm sure there are some, but for the rest of us, we can't go camping without a campfire! Some of the downsides of sitting around a campfire include bugs, running out of things to talk about, and getting bored watching the same old flames. Sitting around the campfire doesn't have to be a bad experience, and with these tips and tricks, it can bring a new camping experience! Keep bugs at bay - it can get pretty annoying sitting around the campfire getting bombarded by bugs. This campfire tip will keep those bugs at bay. Throw a stick of sage into the campfire. Mosquitoes and bugs hate the fumes. You can also bundle sage and other herbs and nestle these bundles in the wood as you're building the campfire. You'll never run out! Vicks will also keep the mosquitoes at bay. Just dab some on your clothes and you won't be bothered by the annoying insects. Be careful about applying Vicks directly on children's skin as it could be too harsh. Fabric Softener Sheets smell great to people, but mosquitoes hate it! Most softener sheets contain linalool, and mosquitoes aren't fond of that at all. So stick some dryer sheets in your pockets while camping or at the campfire. Campfire Flame is pretty awesome by itself, but what could make the flames more interesting? Chemicals. I don't recommend any of these, but I'll list a few for the dare-devils out there. Copper Chloride will emit a blue flame. Borax Laundry Detergent gives off a light green flame. Water Softener Salt for a purple flame. Table Salt for an orange flame. Epsom Salt and dry Coffee Creamer will emit tiny sparks. There you have it. Some campfire tips and tricks to keep your camping getaway interesting! 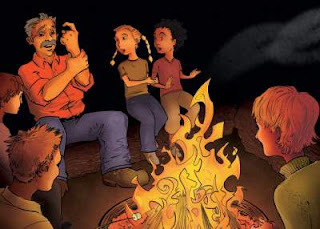 Camping Stories For The Campfire! Copyright © 2013 Camping Comrade . All Rights Reserved.